TAMPA -- Masahiro Tanaka gave up two runs in four innings Monday night, but neither he nor manager Aaron Boone were concerned about the outing, with Tanaka even saying he feels better this spring than he did in a dominant March last year. Second verse, same as the first Tuesday afternoon, only this time, it was CC Sabathia who was unconcerned after his second spring outing, where he allowed one run on four hits over four innings and escaped a pair of first-and-second, one-out jams. "I just wanted to feel healthy, and I felt really good out there today, so that's encouraging," Sabathia said of the outing. "My knee and my arm felt good, and really, my whole body; my lower half is very important for me, and I got out of there with no problems." "I felt great about what I saw," Boone added. "CC has been real sharp all spring, and today was another step, getting up over 60 pitches. I thought he commanded all his pitches, and took a real nice step forward for him on his way." Perhaps the most important in-game work for Sabathia came in the first inning, when the "new" CC got perennial MVP candidate Miguel Cabrera to ground out. The former power pitcher retired Cabrera on a pitch sequence that went fastball, slider, changeup, the latter an 0-2 pitch Cabrera bounced to short. "That's huge for me; he's a great hitter, so I have to try to keep him off-balance, and I can't throw the same pitch to him every time," Sabathia said. "You have to figure out the sequences and ways to get him out. I need all my pitches, and I have to be able to be effective and throw them all for strikes, so that was good and encouraging." Boone was Sabathia's teammate in Cleveland when CC was an overpowering ace, so it's especially satisfying for the skipper to see his now-charge able to evolve like he has. "It's been fun to watch. A couple years ago in my old job, the question was if he could make that transition, because you wouldn't know until you saw it, but there's no question he has," Boone said. "And now, I think you're seeing him getting really comfortable knowing how to pitch with the stuff he has. He sequences really well and repeats his delivery well -- which isn't always easy for bigger guys, but he's a great athlete -- and that allows him to command multiple pitches and throw any pitch for a strike. Like I said, it's not easy for bigger guys, but you marvel at CC"s tempo and command of his body." Fortunately for the Yankees, Tuesday's offense was a little better than Monday night, just enough to get the team home with a 2-2 tie. They actually had just two baserunners through seven innings -- back-to-back one-out singles in the second, and a threat erased by a double play -- before Didi Gregorius' solo homer leading off the eighth tied the game at 1-1 and opened the floodgates. "He's a really gifted player, talented on both sides of the ball, and we think there's even more in there," Boone said of Gregorius. "We're challenging him to go to even another level, and we look to him for leadership because of the respect he has in that room there, being the elder statesman of the infield. We're excited to see him take another step in his progression. The Yankees only got one more run after the fact despite a single and four walks over the final two frames. That was enough for the tie, and they now fight on to Wednesday, where a road date with the Orioles -- and a chance to end what is now a three-game "non-winning" streak -- looms. 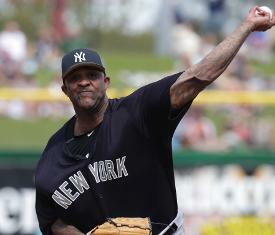 -What's left for Sabathia to accomplish this spring? "Just building my pitches up. I want to get my back-door slider a little more consistent, but I feel good. I just want to keep going, keep building my pitches and get ready for the season." -Miguel Andujar was 0-for-3, but he impressed Boone on defense today: "He's played great over there. I watched a lot of video of him this winter, and the strides I've seen him make this spring, he's been really solid. The two plays he made today -- the swinging bunt, you saw the arm strength and the smooth transfer, and that ball to his left was a great play. He continues to be impressive over there." -Estevan Florial, however, made a poor throw from center field in the ninth to allow the Tigers to score the tying run, but the skipper sees a teachable moment there: "Take what the game gives you. That's a play where you're trying to do something, but sometimes it's not there to be had, and you have to play catch. A good teaching moment there, and something to grow on." -Neil Walker will get a day's worth of at-bats at the Minor League complex Wednesday and get a full day of camp work in Thursday before likely making his Yankees debut Friday, and this was Boone's answer when asked if he thought getting Walker up to speed would be harder because he is a switch-hitter: "There are challenges there about being a switch-hitter, sure, but I think he comes in here a little more ahead of the game because he was working out at that camp, so I think he's a little further along than a guy just coming in here cold on March 13." -Walker did some fielding work at first base on a back field today with Mark Teixeira and infield coach Carlos Mendoza, and according to Boone, "Tex said he looked really good." -One more from Boone vis-à-vis Walker -- multiple players whose roster chances were put in jeopardy by Walker's addition had strong games over the last 24 hours, and here's Boone's take on whether that's coincidence or not: "You never know, but a lot of times, competition brings out the best in people." -Chance Adams starts Wednesday in Sarasota while Luis Severino stays back in Tampa to get his work in, and then Sonny Gray and Jordan Montgomery will go on Thursday and Friday. That's all five planned starters working on five consecutive days, but the role of Opening Day starter is still in the air: "Larry (Rothschild) and I have had conversations about it, and we're starting to hone in on it. Nothing is final yet, but those conversations are starting to happen with a little more urgency." -Last word goes back to Sabathia, this his answer when asked about his take on former teammate Boone as a skipper so far: "He's great. He's been a great communicator, but I knew he'd be good at that. I'm excited for him, and I'm excited for everyone in the room to get to know him the way I know him."